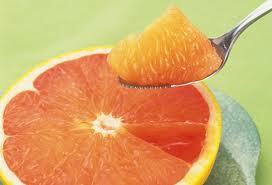 My mother taught me how to eat grapefruit in our living room one balmy summer evening. She instructed me to cut the large fruit in half between the two ends so there were perfect triangular pockets to scoop from. She even let me use a special spoon with a serrated edge to scrape out the fleshy pulp. She laughed at my persistent efforts, swiping a blush across her brightening face, even though her stomach was always tied with anxiety from the pervasive stress of piling bills. She handed me sugar to sprinkle over the half I held in my sticky, dripping hand. Her face was beaming as I took a spoonful of the bitter fruit, sweetened to enjoyment by a simple touch of sugar. Coming across this again inspired me to start thinking about the way we approach food in our homes and how eating like a kid could really be healthy. 1. Make your best memories revolve around healthy food. Wouldn't it be great if our kids had predispositions to eat berries because the family always went berry picking in the summer? Or cucumbers because they nurtured them from seed? Or veggie skewers because that's what you always served at family picnics? Or spinach because that's what turned their "Zombie" smoothies green? I'm so glad my memory revolved around a grapefruit and not a Snickers Bar. I admit, we occasionally ate Oreos by the row, but if you can make an equally poignant memory revolve around healthy food instead of junk food, then by all means try it! 2. Turn away your head when you're full. Something happens between our first bites of food around 6 months of age and adulthood. We stop taking cues from our bodies somewhere along the way. Feeding an 8-month-old is easy. You just feed them until they turn away their heads. As we get older, we fight those natural signals and stuff ourselves until we're uncomfortable. Stop eating when you feel sufficiently full or when you know you've eaten enough. 3. Make food fun. Did your mom ever plant "trees" (broccoli) on a hill (of mashed potatoes) for you? Did your dad ever drive your spoon around like it was a train headed for the depot (your mouth)? Food was fun when you were a kid. I encourage you to make food fun again! Make it a point to try a new food or healthy recipe each week. Toy around with the colors, textures, spices, pairings and presentation. Cut fruit out with cookie cutters. Lick the spoon. Become familiar with the playground. Food should not be your enemy, it should be your plaything. 4. Don't think about food while you're playing. When you're not eating, don't obsess or worry about food. You've never seen a child in the throes of a playground wondering if dinner will come soon enough. Let yourself get carried away with non-food activities. Believe me, when you're busy with an involved project, you won't be thinking about the Girl Scout cookies calling you from the cupboard. Don't allow thoughts about food to control you. You get to control your thoughts! 5. Eat slow. Your toddler isn't allowed to leave the table until he's cleared his plates, and that usually comes about a half-hour after everyone else is finished. We may practice better manners as we get older, but we surely forget how to eat as mindfully as a child. Slow down. Taste, I mean really taste, every bite. Chew it. Put your fork down. Look away from that screen. And take a cue from Junior. Thanks Anne! I try to be super mindful of this with my own son. We even drink tea together. What a thoughtful post with some really great ideas! I, too, vividly remember my father preparing grapefruit for me- there's nothing else you eat that way, it was fascinating to me as a little kid! Aw these tips are ace and I don't even have a kid! What gread advice especially the memories one, I only ever went berry picking once when I was a wee one. I am so bad at not stopping when I am full, especially if it is naughty foods so I will be taking your advice!